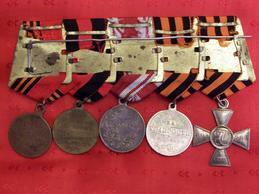 You are looking at a group of russian imperial medals and a St. George cross. The first medal is the medal for the Russo-Japanese War. The Bronze Medal was instituted on January 21, 1906 during the reign of Tsar Nicholas II. The award was created to commemorate the 1904-1905 conflict between the Russian and the Japanese Empires. On March 1, 1906 Emperor Nicholas II issued a decree stating that individuals that had suffered wounds in action were to add a bow to the ribbon of the Medal. The second medal is One Hundredth anniversary of the War of 1812. This light bronze medal was instituted on August 12, 1912. It was awarded to all generals, commissioned officers, non-commissioned officers and enlisted men in the Russian Army and Navy who were serving on August 26, 1912 in military units and detatchments of the Navy which had participated in the War of 1812. 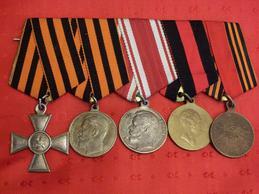 The third medal is for zeal of Tsar Nicholas II. The Medal was first instituted in December 1801 during the reign of Tsar Alexander I. After the death of Tsar Alexander III the Medal was redesigned and issued around 1894 bearing the semblance of the new Sovereign, Tsar Nicholas II. The Medal was awarded to civilians that had shown exceptional zeal in the trade, production and social fields as well as to military personnel for zealous service. The fourth medal is the medal for Bravery, fourth class, # 1019179. In 1913, this medal was renamed the St. George Medal and was awarded to enlisted men and non-commissioned officers for bravery during peace or war, and to civilians (male or female) who displayed bravery during wartime. Diameter: 29 mm, Ribbon is St. George. The cross is the St. George cross, fourth class, # 691206. A major reform was enacted by Emperor Nicholas II on August 10, 1913 as a decree was passed concerning the statute of the Military Order of Saint George and that of the Insignia of Distinction of the Military Order.